Years ago, the earth passed through a cloud of space dust, causing the dead to rise with an insatiable hunger for human flesh. Terror spread across the land, until a collar was invented that made the zombies docile, even useful. A company was born: ZomCon. Thanks to their patented domestication collar, zombies became gardeners, milkmen, servants, even pets. ZomCon would like everyone to believe that they have the world under control. But do they? Timmy Robinson (K’Sun Ray) doesn’t think so. He thinks the world is “phony-baloney”. An awkward loner, Timmy spends so much time in his room even his own parents don’t notice him. So when Mom (Carrie-Anne Moss) buys a zombie (Billy Connolly) to help around the house, Timmy is surprised, and even curious, when the beast wants to play catch. When the zombie saves him from the local bullies, a true friendship is born, and Timmy names the zombie “Fido.” But Fido’s collar goes on the fritz, and the neighbors start paying the ultimate price. To complicate matters, ZomCon’s notorious zombie-control specialist, Mr. Bottoms (Henry Czerny), has moved in across the street. What begins as a small town story about a boy and his best friend becomes a biting satire about our world, the price of fear, and the rewards of risking love. 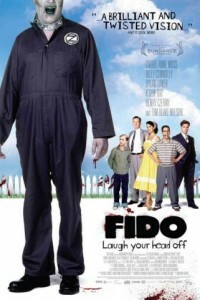 “Fido” will rip your heart out.